I’ve been asked to share very sad news about Higgins. He died this morning, and his wife Nancy could use all the support we can give her. Those who were close to them, please reach out if you can. You may email me for contact information at tamara@postpro.net, those with my phone feel free to call. Awful news, Tamara. My condolences to you and to Nancy and all of Tom's friends and climbing partners. One of the greats. Rest in Peace, Tom. Just a few months ago, he shared some stories and photos from doing the first ascent of Shake and Bake at the Pinnacles. 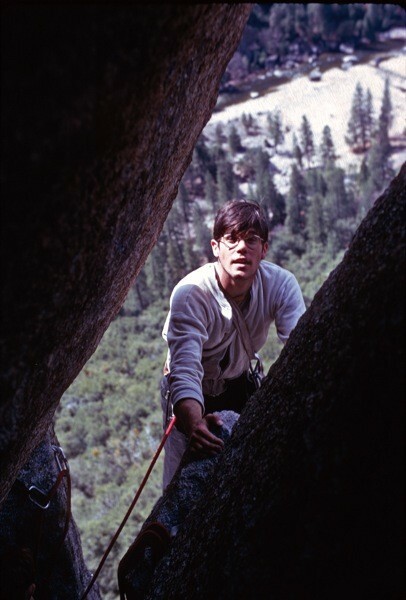 Tom Higgins, belaying on the FA of Shake and Bake, Pinnacles, 1976. What a great photo, Clint. Thanks for posting it over here. I knew Bev from climbing with her some in the 70’s. We did a number of short crack climbs in Yosemite. She had an infectious energy, raw power and determination on the rock which I much admired. I also loved how she handled being a woman climber when there were few and when lots of men were threatened by the thought of a woman entering their prized mostly male sanctuary. She entered the holy place without knocking and blasted around with such confidence and verve it made all the chauvinism look utterly silly. I have not told the following tale anywhere because it is hardly my proudest moment or hers (I can’t find any writing of hers on the climb either), but Beverley and I did Astroman in the early 80s, nearly coming undone in the process. I was determined to get it free within my old traditional standards of few falls, no hangs and starting over after falls from free stances or pitch starts. I was still in rebellion against style transitions of the day and prone to occasional mad proselytizing on the subject. Beverley respected my desire and knew about my stylistic warring but mostly just wanted to do the climb however we did it. Off we went. All went well until the Enduro Corner. Beverley tried to lead it but half way up got tired and started hanging for rests. She was angry at herself the more she rested. I was quiet at first, and then in a rising pissy mood protested, “NO AID.” She told me to f*#k off. I said we should rap off if we couldn’t do it in good style. She challenged me right back saying something like, “Let’s see you do it right.” Now I was wildly fired up to give it a go, just the mood I needed looking back on it. Down she came and up I went. She was grim faced but I ignored her. We should have talked it out but didn’t. When I was about a third of the way up the corner, she told me she wouldn’t hold me if I fell and I’d just have to start over. “Fine” I yelled back. The camaraderie we had established over several climbs together was falling apart. I found there were a few edges on the right wall allowing rests here and there and managed to get near the end of the corner without a fall before the crack opens up. Suddenly a batch of swallows burst out of the crack into my face and off I went, screaming. Before I could say anything, Beverly, true to her promise and the very rules I touted for the climb, lowered me away to start again. At the belay ledge I looked at her and said, sheepishly, “It wasn’t my fault!” She looked at me with her soft but penetrating eyes and slowly started to smile, then laugh. Our temper tantrum melted away thanks to her good heart. She, unlike me, was looking beyond the climbing to its meaning for two people who loved the walls. We sat and laughed for several moments. Then, looking over to Half Dome starting to turn golden she slapped my leg and said, “You’re a f*#ker!” I said back, “I know.” I remember that interchange like it happened yesterday. I guess it was what I needed, because I got the corner next try and Beverly followed it with only one fall and rest, and was fine with it. Condolences to Nancy, his wife, and their daughter, Bonnie Kamps who, with Bob Kamps, was SO IMPORTANT in his life, and all others who knew him. 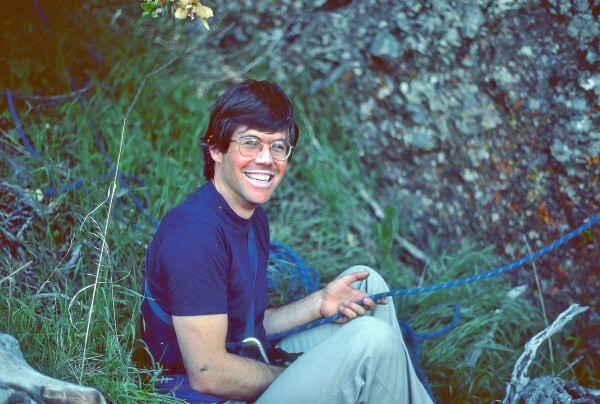 When Russ phoned with the sad news, we both cried and spoke softly, remembering our early climbing origins at Stoney Point where we transformed ourselves and each other from boys to men, growing outward, if not upward, toward tiny holds and mountain summits, both within and beyond our grasp. A short while ago, I spoke with Nancy, Tom's wife, and she was very present and clear as she spoke about the challenges Tom faced in his recent days and weeks. Considering the circumstances, seems to be doing quite well while waiting for their daughter to arrive from out of town. A couple of photos of Tom as most of us knew him best, handsome and smiling while enjoying his connection to the rock and himself. 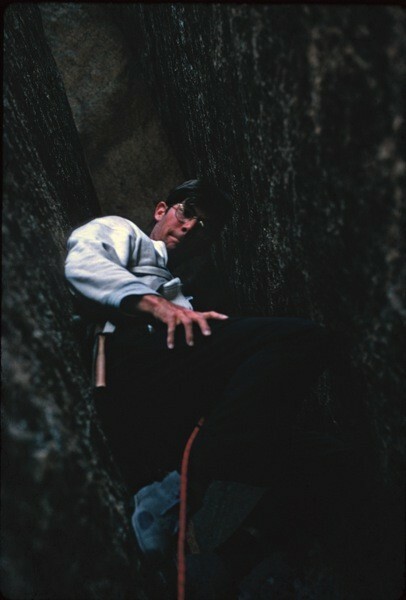 If people only knew how hard those routes Tom at put up Tahquitz, back in the 60s, in junk shoes. Try and climb the last pitch of Jonah in lug sole shoes and you're looking at 5.12 for sure. And run out as hell. All of us Stonemasters followed Tom's footsteps, along with Kamps and Powell and all the rest. But Tom was a special talent. Very sad. He was always one of my heroes. His web-site http://www.tomhiggins.net/ has lots of his writing and photos. Always thought if it's a Higgins route, be prepared. RIP Tom. Of the recent passings, this is the one that got me crying. Condolences to family and all our community. I let out a cry that frightened my wife. Tom and I weren't close friends, but we shared a friendship with Bob and Bonnie Kamps and Pat Ament and found ourselves the same places over the years. We are part of a generation (technically more like three generations) that has been shedding members, both famous and not, for the last ten years, and I find the loss of one of the tribe often seems surprisingly personal, perhaps because our adventures were part of the same era and that era disappears as we do. I had heard about Tom's struggles with back pain. He is now, finally, at rest. My sincerest condolences to Nancy and to his friends and folks like me, who felt a deep connection even without the bonds of a personal friendship. I knew Tom mostly through my work as President of Friends of Pinnacles. mailbox from Tom with a note of thanks. would write a piece about the FA of the Pinnacles Classic Shake and Bake. penned 41 years after the first ascent. and referenced many, many years later. time to go out now and log a few miles in his honor. What a shame...his excellent essay "Tricksters and Traditionalists" was an influential treatise on first ascent climbing style! So sorry to hear this, condolences to all Tom’s friends and family. 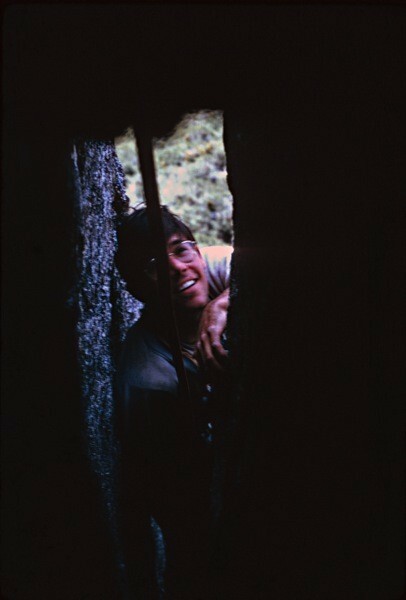 Tom was already a living legend when I started climbing in the late 1970’s. My friends and I actively sought out his routes in Tuolumne, because we knew those routes would be full value. My deepest condolences to Nancy and their daughter, Alanna. This stunned me. I used to meet with Tom, Bob Kamps, Mark Powell, Rich Goldstone, and others in August in the Needles of the Black Hills. I would sit back and watch Tom and Bob carefully work their way up some forbidding spire, tip-toeing on tiny nubbins, always in control. A beautiful thing to observe. My condolences to family and friends. RIP, Tom.